"Policronia Estolastico de Guadalupe Anzar (Lupe), married Miss Zanetta of San Juan, and they have three interesting children." "P. E. G. Anzar is known at the present time throughout this section as "Lupe," and is now living at San Juan. The Anzar boys were schoolmates of mine. 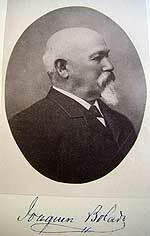 "Lupe" Anzar attended Santa Clara College in 1868, and left it in 1870. At that time he established, with Pablo Vacca, a wholesale butcher business in Los Angeles. He also ran a livery stable in that city before returning to San Juan in 1876. He married Mrs. Wm. Breen, who was the daughter of Angelo Zanetta, and was the widow of William Breen, the youngest son of Patrick Breen. Mr. Anzar's marriage occurred in January, 1877. This date I remember distinctly as I had married about a month earlier. About a year ago the Anzars celebrated their golden wedding anniversary, and an immense crowd attended the celebration." "Early days at the mission San Juan Bautista", by Issac L. Mylar; a narrative of incidents connected with the days when California was young.